Bugs Bunny is playfully ushered out of the kitchen in this classic moment from the 1954 film directed by legend Chuck Jones. Bugs Bunny sets out to rescue the Tuetonic Toddlers, Gretel and Hansel, from the wicked Witch Hazel. Bugs infiltrates the witch’s cottage disguised as a Truant Officer alerting the children that she is indeed a witch who plans to eat them for supper. The children escape, but Witch Hazel doesn’t let Bugs get away so easily. 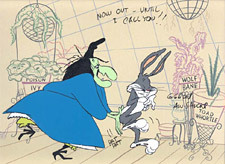 This is a hand-painted Limited Edition Cel, with an edition size of just 50 works of art, each hand-signed by voice talent June Foray, and bears the signature mark of Chuck Jones.